Born 29 days after Beeching took up the chair of British Railways Board and closed so many railway lines, I grew up with abandoned railways all around the country. Many of these have become footpaths, some of which I have walked upon. Today we travelled on a railway which re-opened last September. We had intended to do this much earlier but poor weather and other commitments meant it did not happen until today.It is the northern part of the old Waverley Route which used to run between Edinburgh and Carlisle and which was closed in 1969. The train takes an hour to get from Edinburgh to Tweedbank through some of the communities I used to work in and which are almost unrecognisable 30 years later as so much new housing has been built. At one point I had thought that I might walk along the abandoned railway line alongside the A7 as part of my planned walk from my home in south Cheshire to the one in Edinburgh. That will not happen now and I have found an alternative route. 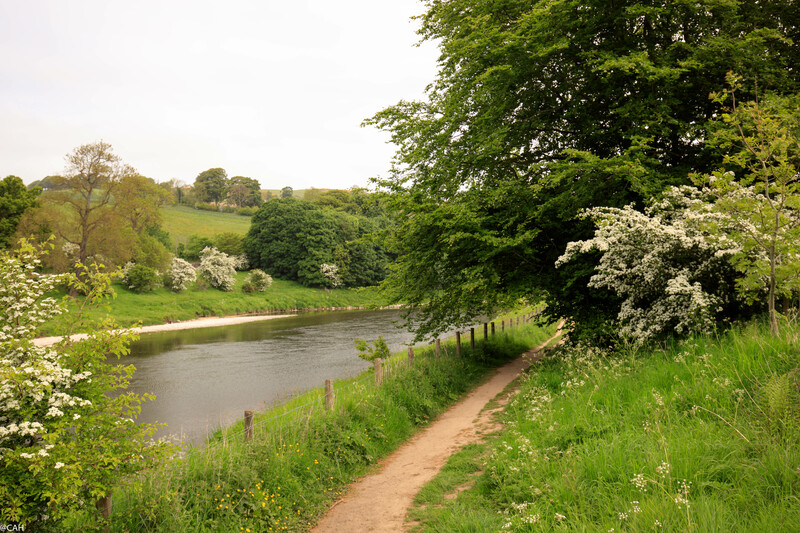 From the station at Tweedbank there is a cycle path to Melrose but you can divert on a footpath by the River Tweed which is part of the Southern Upland Way and the Borders Abbey Way and takes you into Melrose. 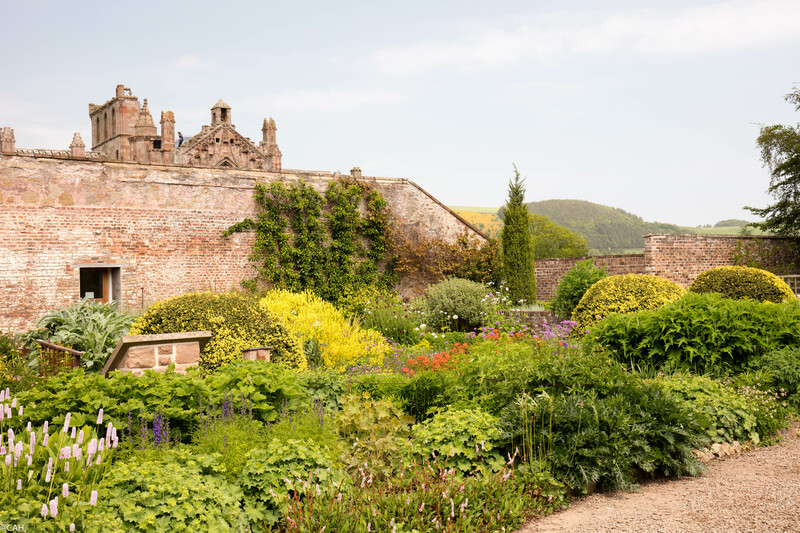 One of the first places it passes is Skirmish Hill, site of a battle in 1526 when Archibald Douglas, Earl of Angus, was challenged by Walter Scott of Buccleuch over the custody of the 14-year-old King James V. Wildflowers were in bloom along the path and particularly striking was the comfrey. Nearer to Melrose we arrived at the Gattonside Suspension Bridge which is also known as the Chain Bridge and opened in 1826. In the town, we had a snack, bought some books (Melrose has a new and a secondhand bookshop) and explored the Priorwood Garden and dried flower shop which gave me some more ideas for drying my own flowers and plants. From the garden and surrounding streets you can see the abbey. We did not have time to visit it today but walked back along the path to the station. Back in Edinburgh it was time to replace my old rucksack which has done many miles but is slowly falling apart despite lots of repairs. That done, we headed back to flat for diner with a friend before planning tomorrow’s journey. 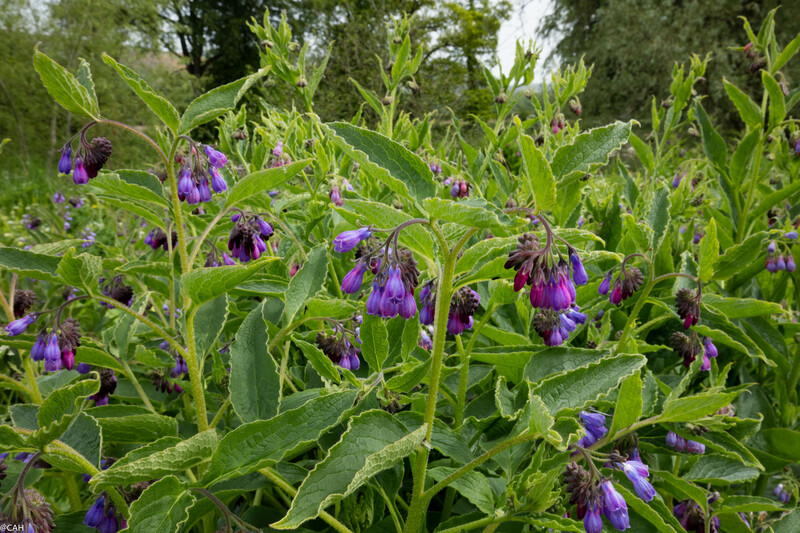 Gorgeous shots; who knew comfrey was so stunning. Very interesting history of the railroads, etc. Have fun tomorrow!